Ryanair is to cut back flights from Stansted after the airport doubled its charges. The rise means it is more profitable for the airline to ground some flights this winter rather than fly them. You might think you have thought of everything when driving abroad but there are a few rather obscure rules that could catch you out. I read this article that highlights a few things to think about. Some of the more obscure rules were that if you stop at a pedestrian crossing in France you may incur a penalty for holding up traffic. In Spain you need to check the date before parking on a one way street. 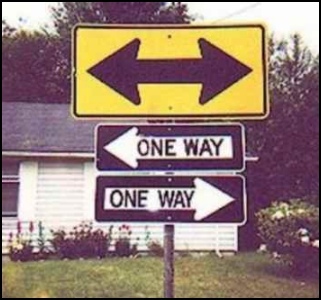 On uneven dates you must park on the odd numbered side of the street and on even days the opposite side of the street. In Germany you can be fined if you park facing oncoming traffic. All tips that I was not aware of. The article also provides useful advice of motor insurance abroad, such as checking to see whether your current insurance covers you for driving abroad and taking out foreign breakdown cover. This weeks PC2Paper travel blog of the week is "My lifechanging journey", the blog covers the unusual and fascinating journey of Liani and Maria and their two Jack Russell's Katryn and Dante through South Africa from St.Lucia to Cape Town (one of their first journeys). 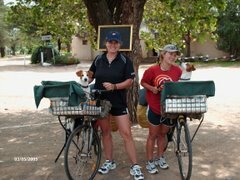 It's a long journey especially when done by bicycle with baskets fixed to the front for their little Jack Russell's to accompany them. The thing I found the most fascinating about their journey is how they never encountered any of the dangers you usually associate with South Africa these days. 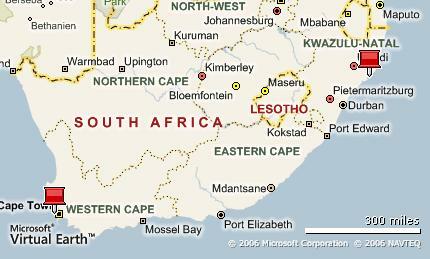 This blog instead exposes the natural beauty and friendliness of South Africa. Caerlaverock Castle in Scotland is hosting its clash of the champion;s event this weekend. The champions will go head to head at archery, quarterstaff, wrestling, spear catching and swordplay. There will also be some bird of prey demonstrations and a medieval village where you can try your hand at archery and other crafts. Westminster City Council are holding talks with Post Office bosses about taking over local Post Offices and perhaps running them within local authority buildings. It will be interesting to see whether this gets the go ahead and it’s certainly good to see the council appreciates how important the Post Office is to the local community. Hong Kong, a former British colony is now one of the major cities of the Far East and an international business centre as well as a major travel destination for tourists. The city boosts vibrant shopping centres and a wealth of restaurants as well as some educational museums and interesting temples that you can visit. As always with any travel destination it’s a good idea to do your research before you go, in order to make the most of your stay. Asia Hotels is a site which not only has detailed information on Hong Kong hotels but is also a definitive travel guide. Using their search facility you can search for hotels in Hong Kong to bring up results to match your arrival, departure dates, length of stay and star rating. The website also provides good background information on Hong Kong and what you can expect when you arrive. It includes information on the local weather so you know what sort of temperatures to expect and also contains information about possible seasonal problems such as typhoons and black rainstorms which can occur this time of year. It also has a travel tips section that includes useful pointers from people who have already visited the city, including tips on what restaurants are good or what a certain hotel is like. It’s certainly worth checking out this wealth of information when planning your trip. Heathrow airport is planning to introduce fingerprint checks next year. The new checks will be introduced when Terminal 5 opens in March. The checks are as part of a scheme to stop passengers evading immigration control. They are necessary because a passenger is currently able to arrive on a foreign flight and board a domestic flight form the same terminal, thus avoiding immigration. There has been a big emphasis in the news recently about reducing your carbon footprint and as we all know, travelling causes a great deal of carbon emissions. This week's travel blog is Great Green Travel. The blog is aimed at the environmentally conscious traveller and concentrates on eco-friendly destinations. One really interesting way of being green whilst travelling is to spend a week working with the US Forest Service. For only $395 which includes all your meals you can work with them to help improve eroded forest trails by clearing brush to help prevent fires. Another article looks at volunteer programs where you can spend your time helping important projects such as working with people affected by HIV or teaching English in a school. Other articles concentrate on green accommodation such as hotels that have been awarded the Green Globe award for being environmentally friendly. I was thinking of visiting Amsterdam for a long weekend and was just doing a bit of research before I went to see if I could save myself a bit of money. I started looking at Netherlands accommodation to see what sort of prices to expect and found some quite reasonable prices on Amsterdam accommodation for a stay of four nights. Finding cheap accommodation is always a primary concern for me as I am usually travelling on a tight budget, so I don’t want to spend all my money on a room I will probably spend little time in. I found this website that offers some good last minute deals on hotels and the prices are inclusive of all taxes. You can search by check in and check out dates and get a range of accommodation. I was looking for something easily accessible by public transport, so this website was useful from the point of view that it tells you about the local transport links and provides a map showing you exactly where the hotel is located. It also gave a clear indication of what facilities to expect from the hotel and from the room itself. With my hotel found I started to look at other money saving ideas and found that you can get what is called the I Amsterdam Card which you can order online. It covers you for one, two or three days and entitles you to over 30 free offers and reductions including admission to the Rijks Museum, the Van Gogh Museum and Madame Tussauds as well as some reduction on local meals and events. You will soon be able spend your Euros in Malta and Cyprus. They are due to adopt the Euro on the 1st of January 2008 pending the final approval by EU ministers. Other recent countries to adopt the Euro as their currencies include Slovenia who started are using it at the beginning of 2007. Lithuania and Slovakia are also hoping to follow suit pending approval from the EU. This weeks travel blog is Joy Of Camping by Myrtha Chang, the site is a treasure trove of information for camping in the 21st century. One of my favorite articles is Foil Cooking Recipes, the article explains how to cook a whole list of items using nothing more than the trusty old campfire and aluminum foil. And if you feel like desert after all of that, there's even a video on how to prepare foil-wrapped deserts on the campfire! Another favorite article is Bee Stings at Camp, it shows you how to avoid being stung and what to do when you are. If you plan on camping any time soon this site is a must! The Royal International Air Tattoo 2007 is taking place in Gloucestershire this weekend. The event is held each year at RAF Fairford. Aircraft featured in this years show include the B-52, C-17 and B-1B bombers as well as F-15's and the P-51 Mustang. The highlights of the show are expected to be appearances by the F-117A stealth fighter and the USAF Thunderbirds aerobatics display team who have never appeared at the event before. The Red Arrows are also scheduled to appear, so it should be an exciting event. If you are planning a vacation in the UK, you might want to try St Ives in Cornwall. It has recently been named Britain's best seaside town of 2007. You can visit Paradise Park and see the rare red squirrels as well as otters, the parrot jungle and many other species of rare birds. You can also see the Tate Gallery in St Ives and visit some of the many craft markets. An interactive guide is available here. This week's travel blog is gobudgettravel.com. This blog is a mine of useful information for backpackers and those travelling on a tight budget. One article I found particularly interesting on this blog was The 5 Fundamentals of Budget Travel in the Developing World. The article looks at regions such as Southeast Asia, Africa and Latin America which are much cheaper to visit than Europe or North America. The downside as this article points out is that there are few guidebooks to help someone who is planning to travel the less chartered countries. The article has five important tips for travellers planning to visit developing countries. The first tip is that if you book with a local company rather than a tour operator you can not only support local businesses but also pay about half what a tour operator would charge you for the same deal. Other valuable tips include eating the local food which surprisingly can make a real difference to your holiday spend and taking advice from the locals about how best to travel once you are there can also mean you can save you hard earned cash. The Tour de France is due to open in London this weekend. Around 189 riders will compete in the race. The opening ceremony starts at 18:00 today in Trafalgar Square. The riders will race past Big Ben, Westminster Abbey and through Hyde Park. The route goes through Greenwich, Woolwich and Erith before heading towards Kent. It will then go through Maidstone, Tonbridge and Tunbridge Wells before finishing in Canterbury on the 8th July. Afterwards it crosses to Belgium and then France. Our travel blog this week is Brave New Traveler, launched in 2006 it includes original and entertaining articles written by the authors and contributors. They focus on topics such as green travel, photography, writing, politics and culture instead of the destination style articles popular on travel blogs. The article I found the most entertaining was "What's The Worst Thing That's Attacked You?" while scorpion bites can be serious (depending on the type of Scorpion that bites you) our writers bite was not that serious although painful and on his honeymoon! Even after being bitten he asked his wife to take a picture of the culprit for this article! I've been in some pretty bad places myself when traveling and one of the things I can never get used to is spiders and scorpions. As long as they stay out of my tent, sleeping bag or bungalow I'm happy! If you are worried about scorpion stings take a look at this informative article on Wikipedia, remember not all scorpions are poisonous but you should seek advice as soon as possible if you are stung.